Scrum.org and McKinsey & Company joint study was conducted in 2018. 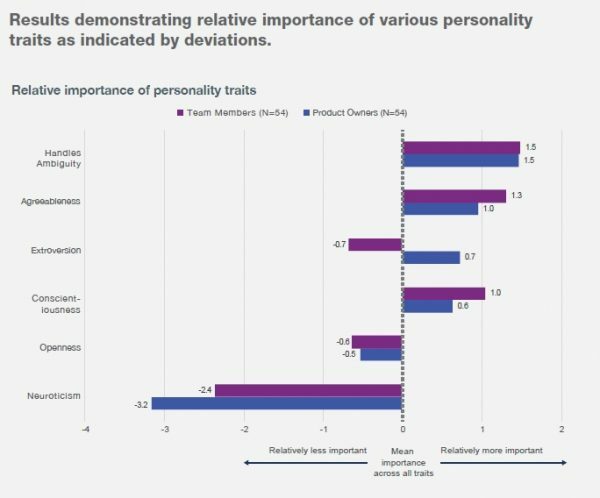 The study looks at the personality traits and work values in two crucial roles for agile teams: The Product Owner and the Team Member. It also covers effective methods of further developing a team’s agility. The study outlines two sets of factors: the personality traits (innate and acquired, and their constituent behaviors) that make an agile team culture bloom, and the kind of values (and their constituent behaviors) that people bring to their work. The findings of this study suggest that the ability to handle ambiguity and agreeableness are most important among personality traits, whereas pride in product outcomes and self-direction are most important among work values. Additionally, the study suggests the importance of being customer-centric as a way to inspire agile teams. Tell me about a situation in which the customer or user of your service or product kept changing their mind and were not sure what they wanted. If someone in the team continues to have a different point of view about the customer and solution you deliver, what would you do? How do you typically deal with this conflict? What has to happen during the course of your day to make it a good one at work? What are your day-to-day activities in this position? Describe a time when you were frustrated at work. Why were you frustrated? How did you deal with it? What impact would that have on the team? Tell me about a customer you helped. What was their problem? Why was it important to them?